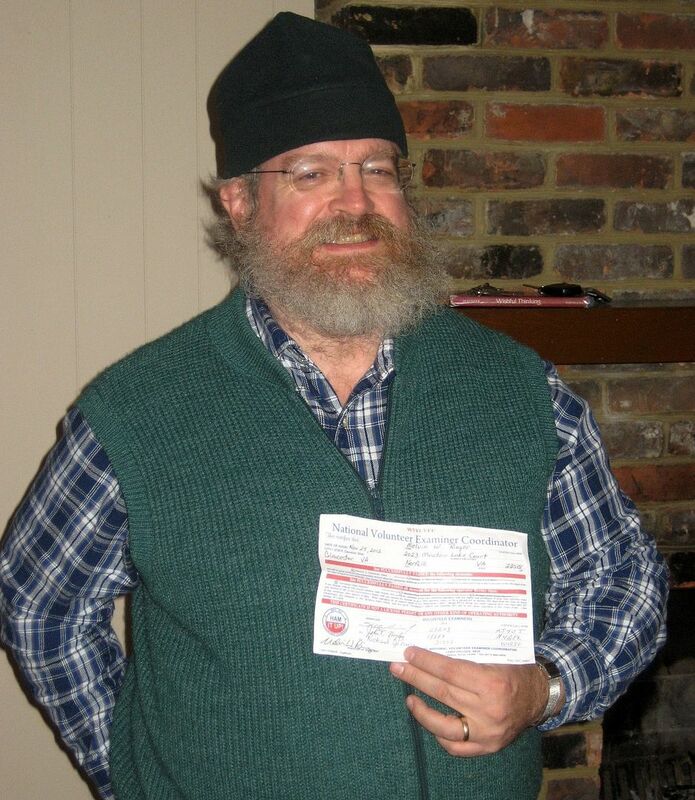 Lookie who got their “Tech” license last weekend! Why it's Wayne Ringer, that's who! He's now a licensed ham, or he will be as soon as his call sign shows up on the FCC database! Oh, FCC, don't keep us waiting! Before long, he'll be joining me on two meters! And he'll be one of two licensed Amateur Radio operators in the country to enjoy the hobby in a pink room adorned with Hello Kitty lights! 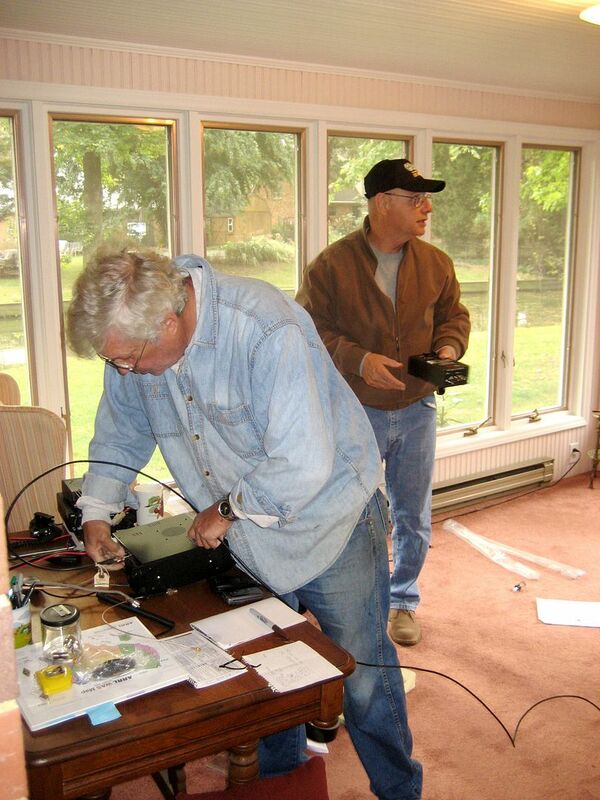 To read more about my experiences with Ham Radio, check out Part I, Part II, Part III and Part IV of this series. About five weeks ago, I passed my “General” (Ham Radio) test which gave me operating privileges on the HF (High Frequency) bands. 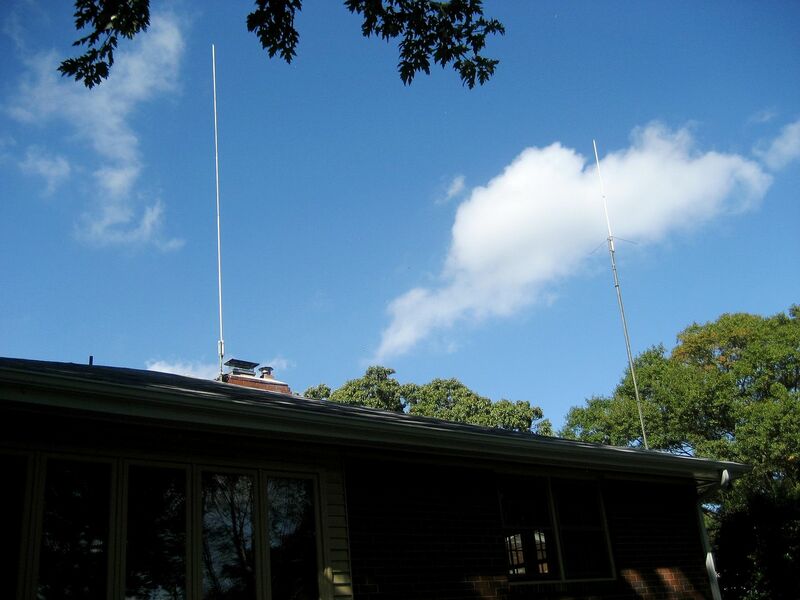 VHF and UHF frequencies are principally line of sight, but on HF, short radio waves can skip thousands of miles, reflecting (and bouncing) between the mirror-like ionosphere and the earth’s surface. Radios producing as little as five watts (which is very, very low power) take advantage of this “propagation” (as it’s called) and can send signals from Norfolk to England, Australia (and more!). A few days after obtaining my General license, I purchased an HF radio (Yaesu 450D), and then last week, my Comet CHA-250BX antenna arrived. And now, both antenna and radio are together. 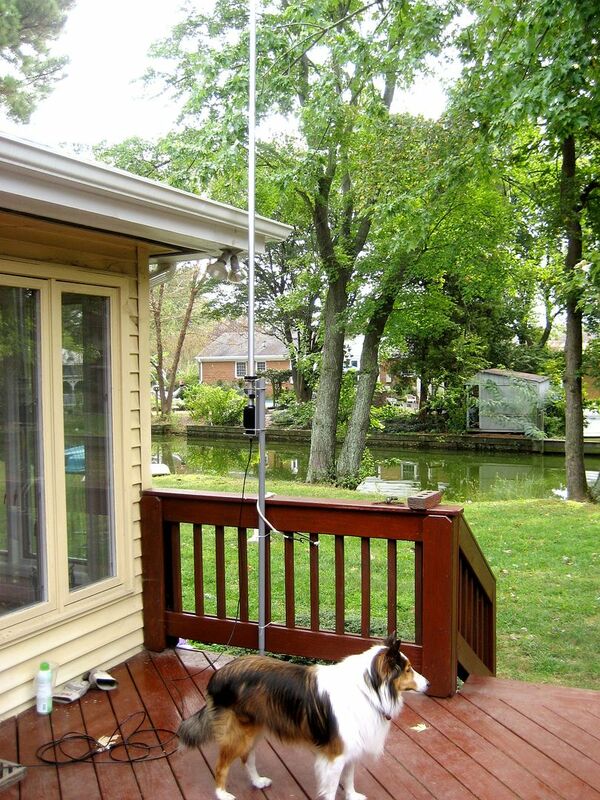 Getting the antenna installed was a bit challenging - physically. 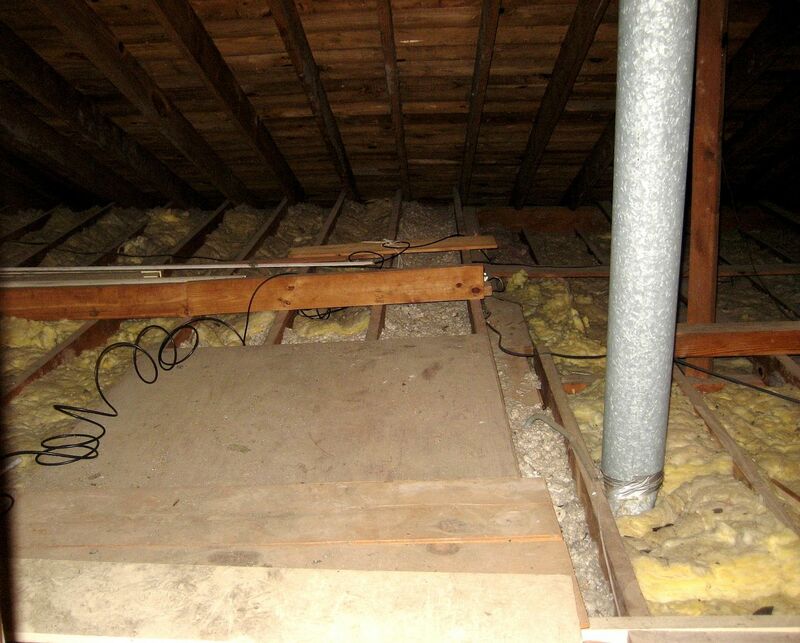 It required snaking wires through the walls and climbing on the roof (over and over and over) and crawling around in the attic, out toward the eaves where there is very little headroom and no flooring. It was a real adventure! According to the manufacturer, the 23-foot-tall Comet CHA-250BX needs to be at least 20′ off the ground. After much consideration, we decided to mount it on the chimney of our brick ranch. To accomplish this, we had to buy a chimney mount. 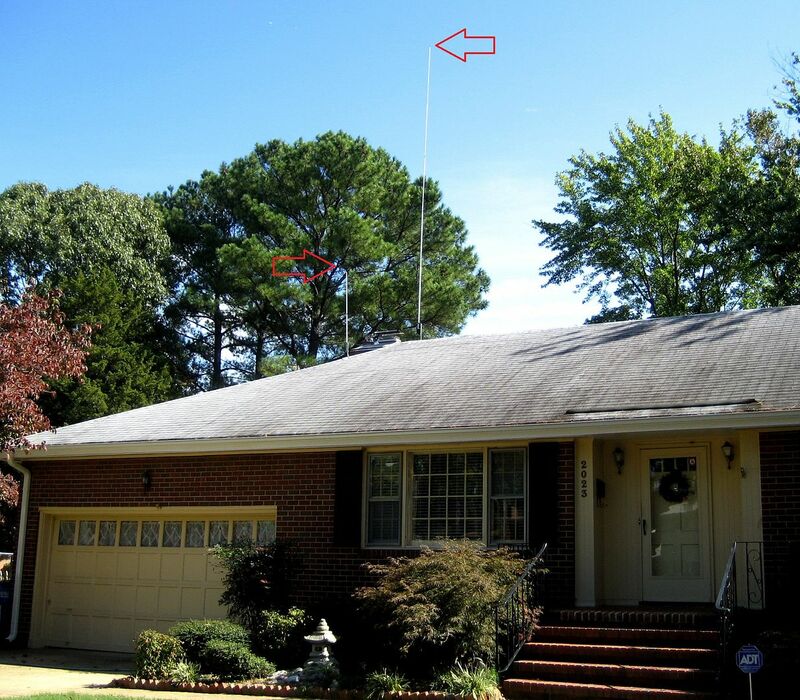 When I was a kid growing up in the 1960s, most of the houses in our neighborhood had an antenna on the roof. 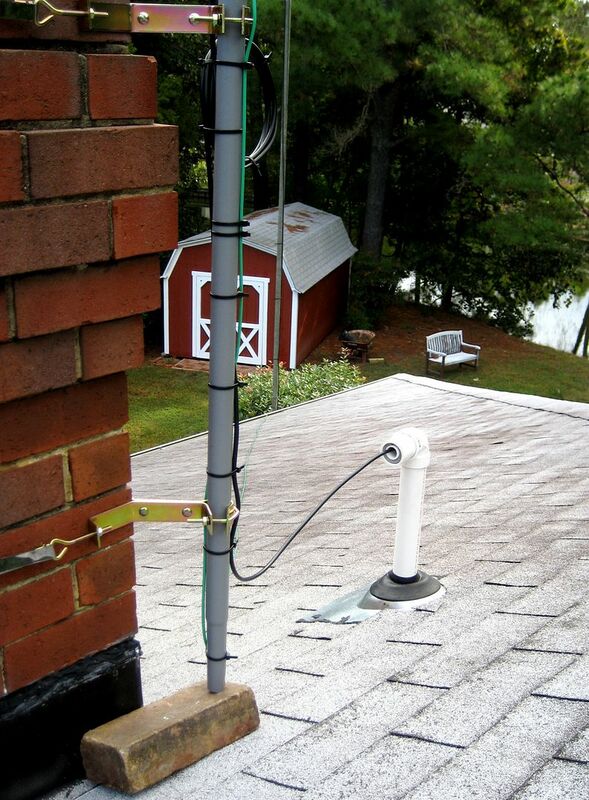 With the advent of cable TV and satellite, it’s getting harder and harder to find the necessary hardware for mounting antennas outside. 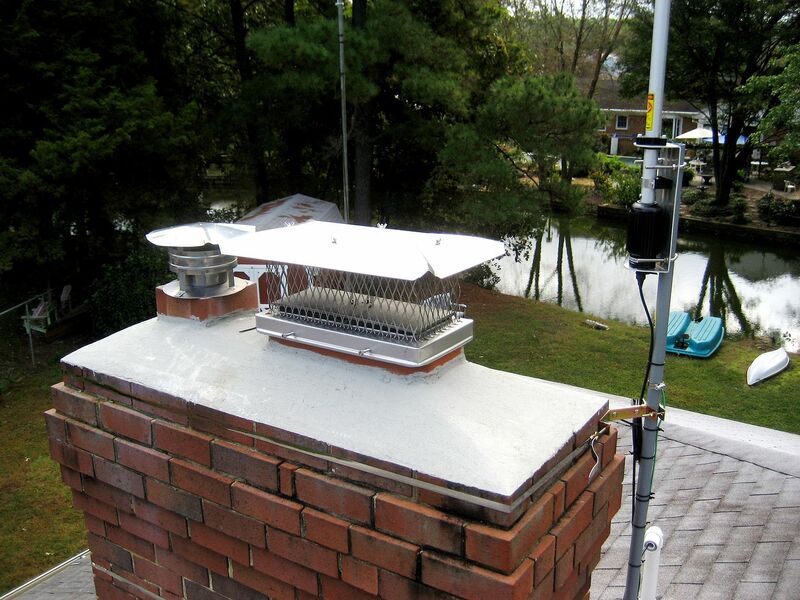 Thanks to Amazon.com, I was able to find a chimney mount that was designed for extra chubby chimneys, like ours. Scroll on down to see photos of the installation process. Updated! I’m now an “Extra”! To learn about the Sears Homes in Norfolk, click here. The worst part of this project was the kneecap pain. I had to crawl out to the attic's hinterlands to drop the RG-8X down the wall (between the studs) with the hope that it would (eventually) end up near my sun porch. While standing upright in my spacious sunporch, "deciding" on the perfect spot for this coax, I neglected to factor in the low clearance between the roof and floor joists out at the edges of our attic. 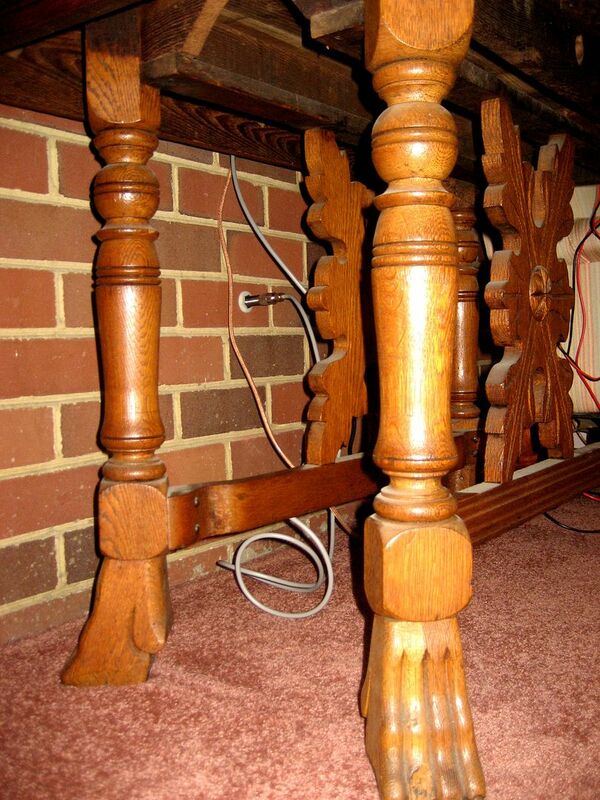 Saturday morning, I spent about 20 minutes with my knees precariously balanced on these joists, drilling holes in these plates, looking for the "sweet spot" where I could drop the coax cable down into the den/sunporch. Years ago, I purchased a set of fiberglass rods that are used for pulling wire through wall cavities. They worked like a charm. 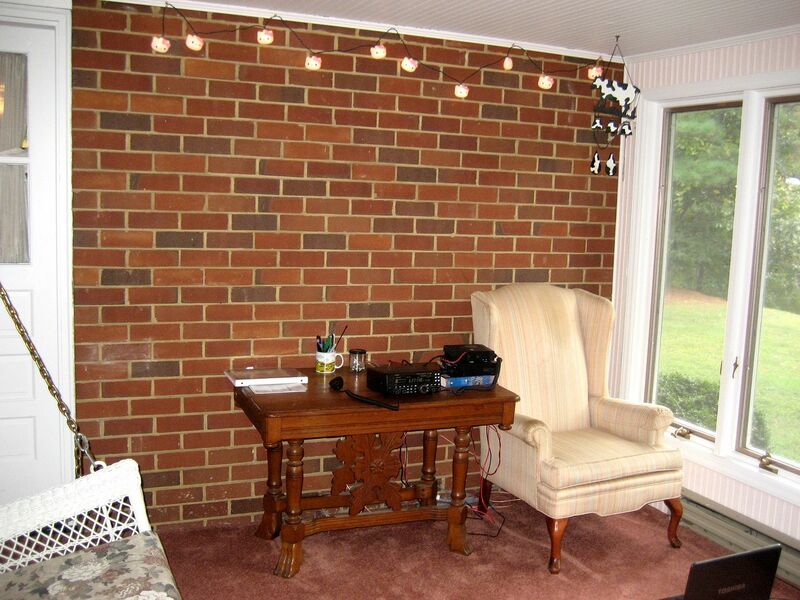 The sunporch was originally a screened-in porch, so I had to penetrate a brick (exterior) wall to get the coax out there. While hubby was away at work, I put a "smallish" hole through the 5/16" thick paneling in the den, and also through the exterior sheathing. I tried drilling through the brick with a $25 masonry bit but that went nowhere fast. That 1960s brick is tough stuff. My friend David Strickland came by and used his hammer-drill to get through the brick. 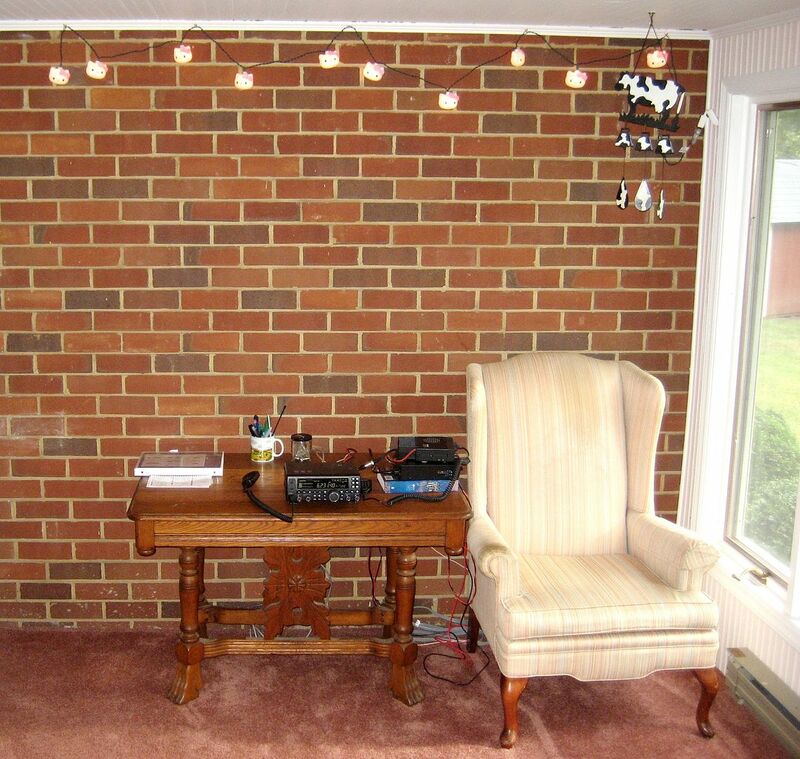 He drilled from the sunporch side toward the den, because (as he explained) the hammer drill had a tendency to "explode" the back side of the brick. He was right. The hammer drill did create a messy exit wound on the back of the brick. I placed a small piece of plywood across the backside of the brick wall, so that the nylon washer and metal nut would have a good tight fit. 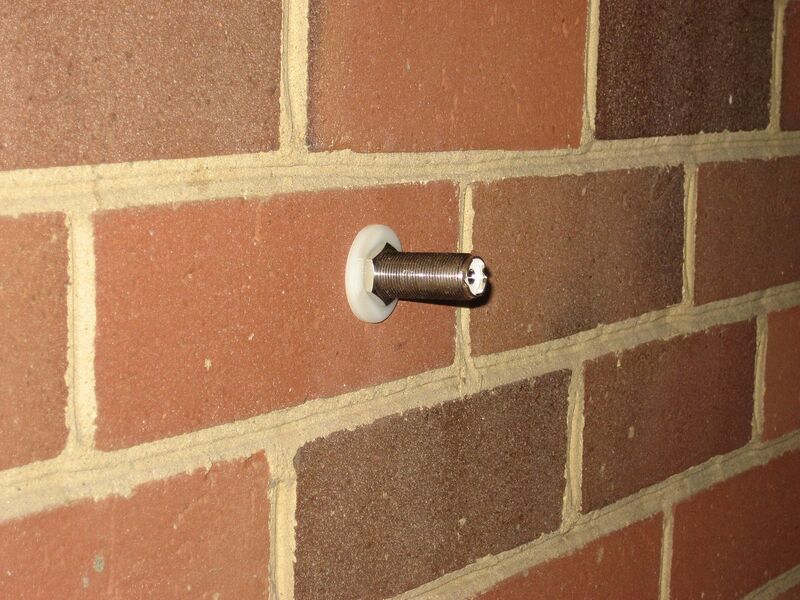 The "through-the-wall" fitting is an 8-inch bulkhead connector, with a 90-degree elbow attached. The other side came out real pretty. 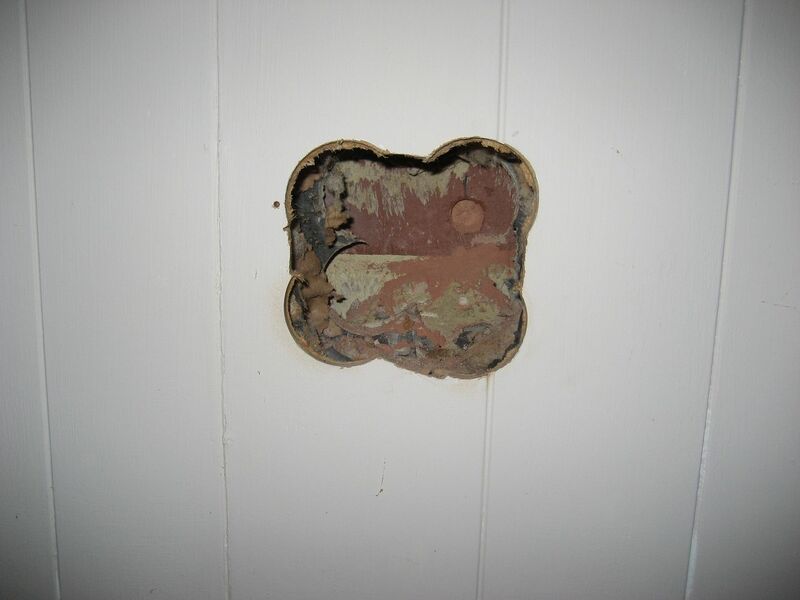 A three-gang, no-device blank wall plate provided a nice and tidy cover-up on the den side of this wall. 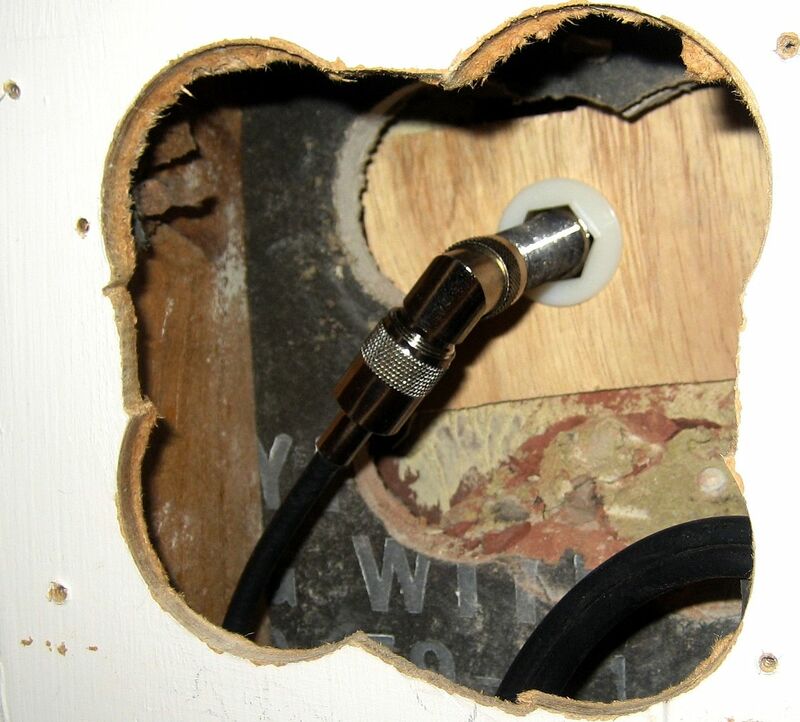 Plus, the connection points for the coax are still easily accessible. My husband suggested that I take a black magic marker and write "Ham Radio Antenna Access" on the plate. I was headed for the markers when he said, "No, don't do that. I'm only kidding." 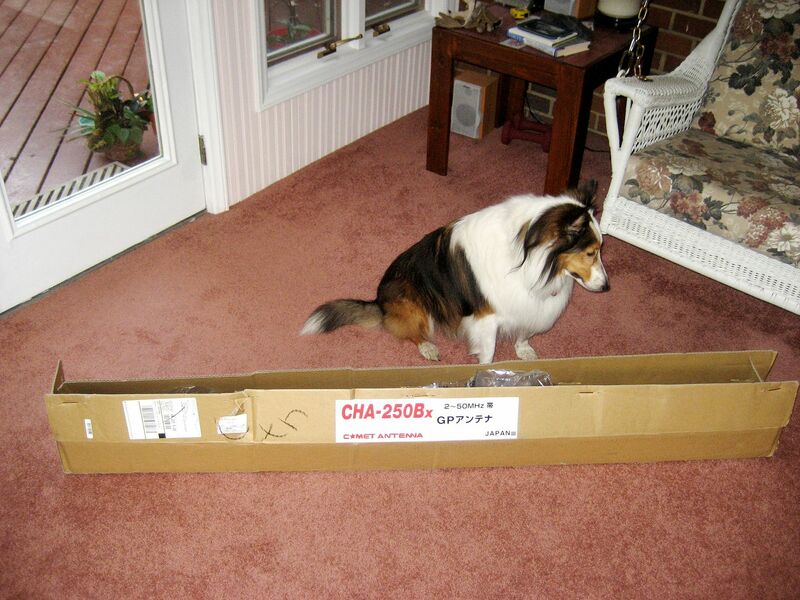 When the antenna arrived, Teddy the Wonder Dog had to inspect the unit. The Comet CHA-205BX successfully passed "the sniff test." Mike Neal and Jim Silverstorf (both members of RASON) came by to help with the assembly of the Comet CHA-250BX antenna. Jim brought an SWR meter to check the performance of the new antenna. By the way, I highly recommend that everyone in Hampton Roads join RASON (Radio Amateur Society of Norfolk). It's not the biggest group in the area, but the people are first-class and they are VERY kind to 53-year-old women who ask the really tough questions like, "Where's the volume button on this thing?" After it was assembled, we had to stand it up and give it a test run. Teddy is on guard, waiting for the radio waves that'll soon come charging into *her* yard. Yes, that's a bungie cord and nylon ties holding it secure against the deck railing. Mike said that all we needed now was an old couch and a cooler of beer to complete the ambiance. 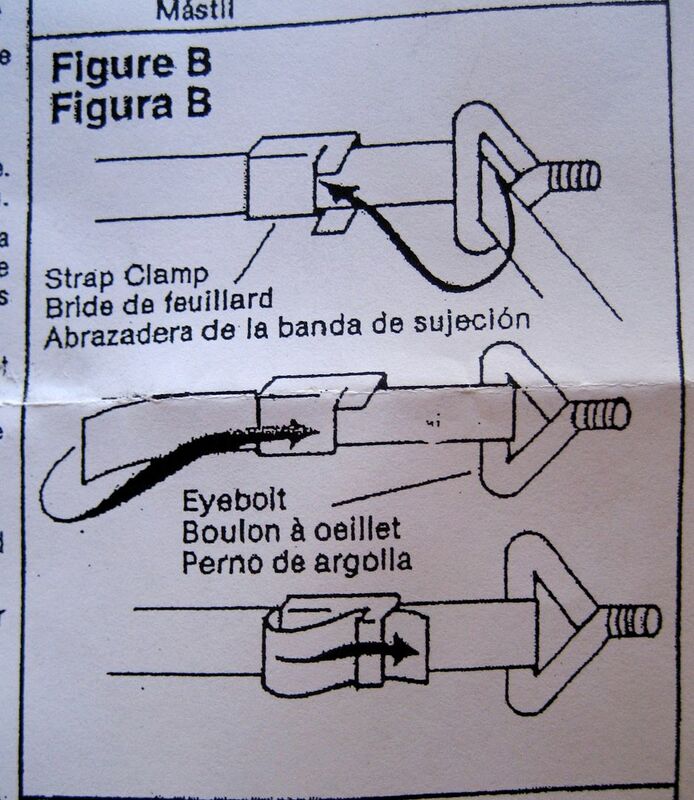 The instructions that came with the chimney mounting kit were as clear as mud. We were not sure what they were trying to tell us. A few more words would have been helpful. Ultimately, we figured it out. Took some time though. 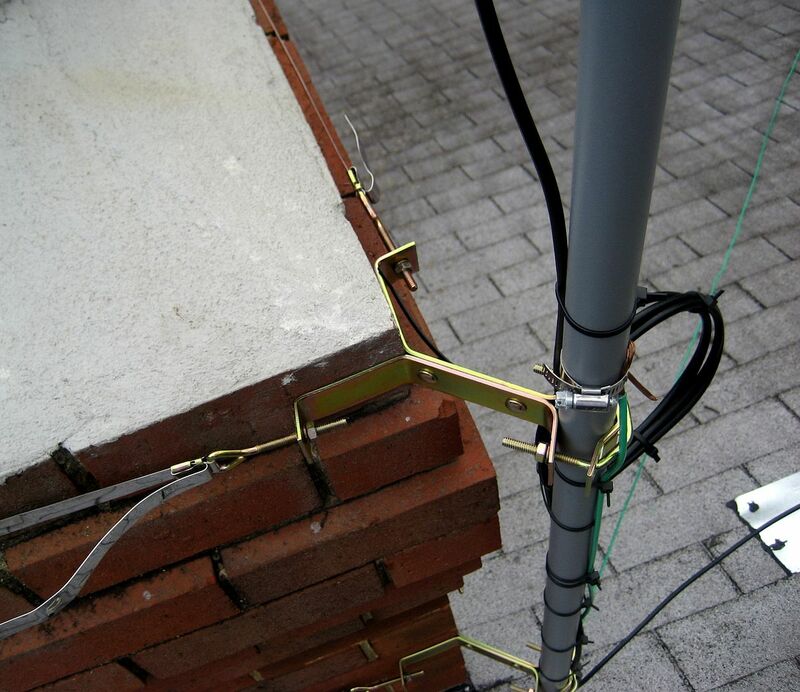 We placed a brick at the bottom of the steel mast, because the chimney mounts aren't really intended to support weight, as much as prevent lateral movement of the mast. 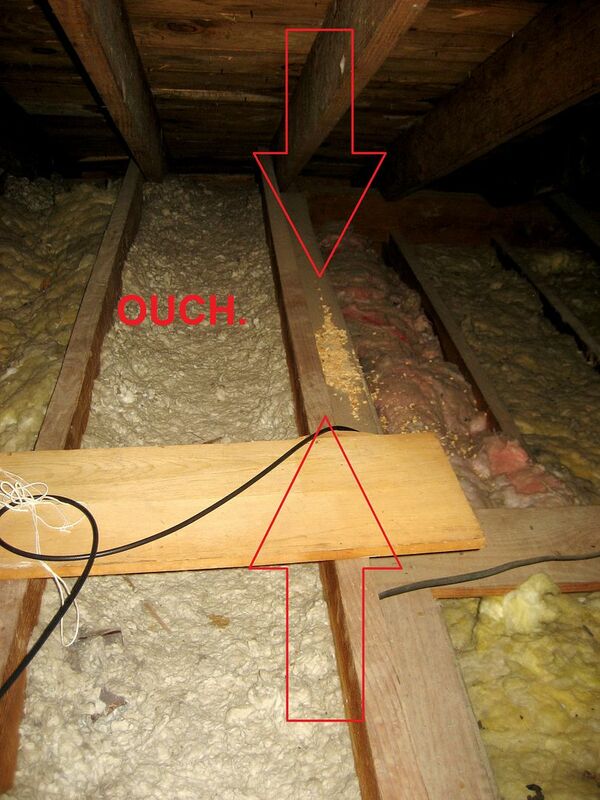 And the brick also protects the 17-year-old roofing shingles from additional damage. Unfortunately, I seem to have grabbed the most crooked brick in America. Another view from the top. When it was time to heft that antenna up to the roof, another member of RASON (Milton Crum) graciously came by and offered to help. 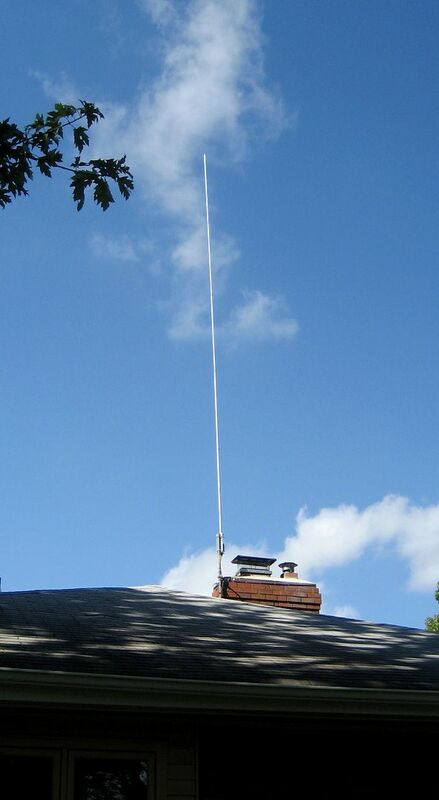 While Wayne and I had expended some mental energy in figuring out how to get this 23' whip antenna up to the roof, Milton had a better way. While I was verbally reviewing the different ways of getting the antenna to the roof, Milt took hold of the antenna and just walked right up the ladder with it. Unfortunately, I didn't get any photos of this part of our adventure. The antenna mount is a "Channel Master CM 9067," which cost about $30 (from Amazon). It took eight days to arrive, which seemed like a long time, but it does seem to be well made. 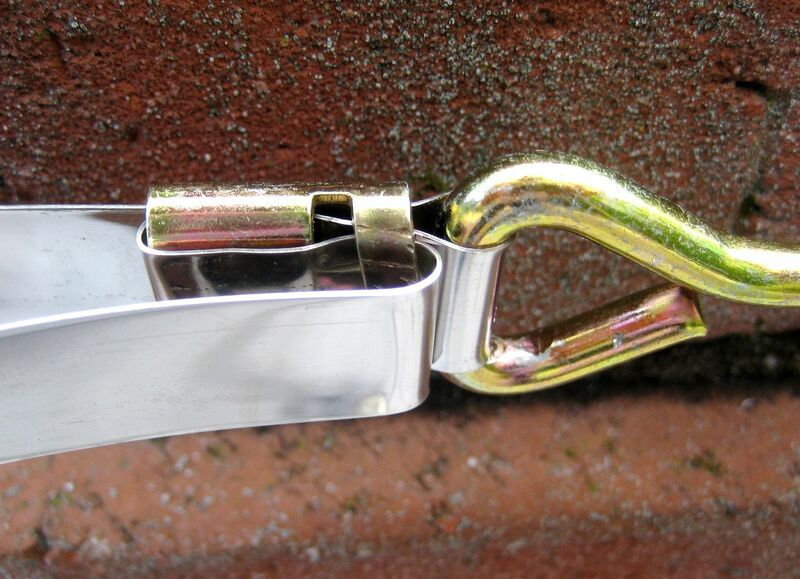 The bands are 3/4" wide stainless steel and 18' long. 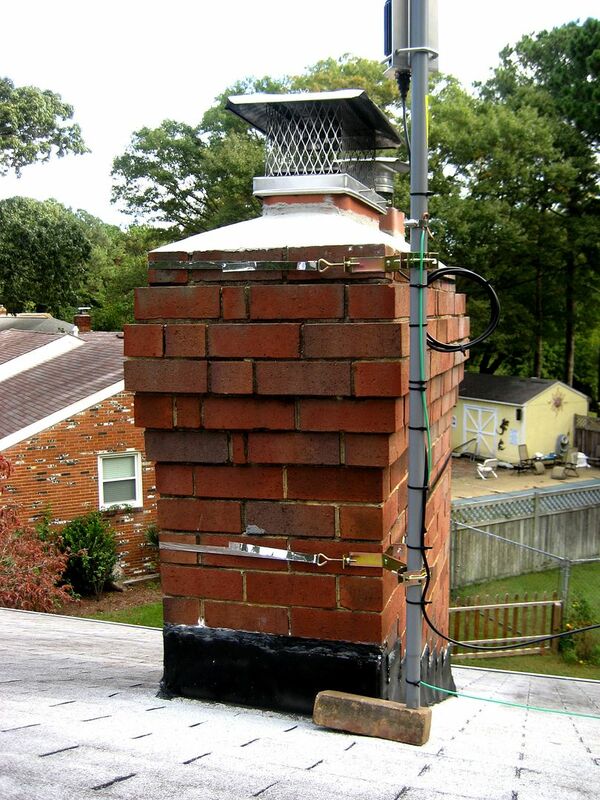 The brackets seem sturdy and strong, and provide a 4" offset (which we needed, due to the flare in the brick courses). Getting from the roof to the attic took a little thought. I didn't want 30+ feet of coax cable draped across my roof, and I also didn't want it cascading down over my new aluminum gutters. I also wasn't too fond of the idea of cutting holes in my soffit or facia. 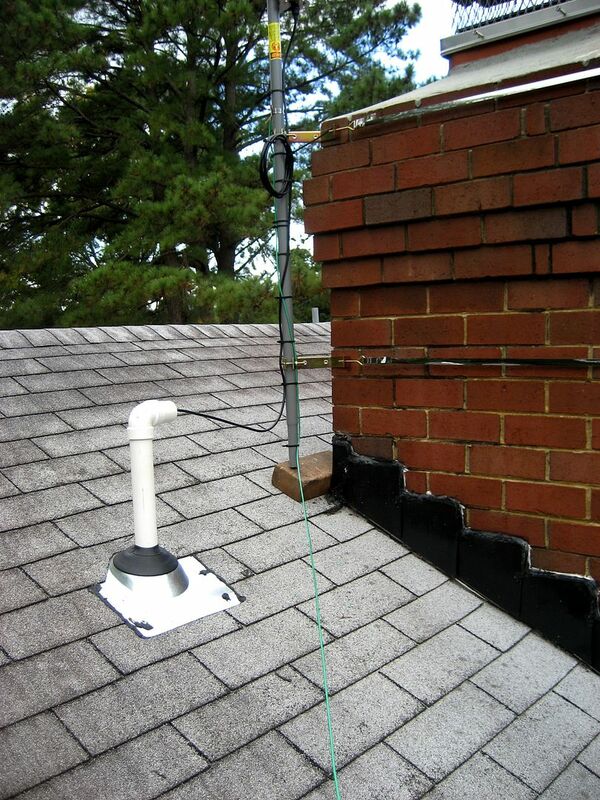 This pipe vent served as an ideal solution. 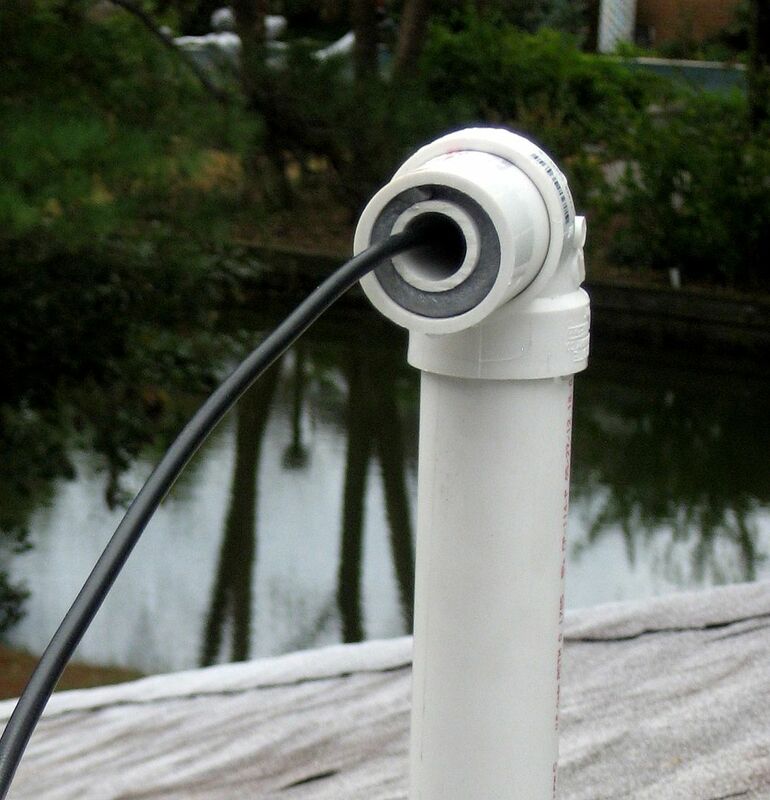 It's 1-1/2" PVC pipe with a traditional pipe collar (where it enters the roof). To prevent rain intrusion, I put a 90-degree elbow on the top. Inside the 1-1/2" PVC pipe is a small stub of 3/4" pipe, with 1/2" round weather stripping wrapped around it. I visited four hardware stores, looking for a 1-1/2" to 3/4" reducer, but couldn't find such a thing, so this was the next best choice. Ultimately, I'll put a little more of that 1/2" round weather stripping in the 3/4" pipe to close up the hole. My Ham Radio friends tel me this is the first time they've seen such a "conduit" as this, but it really worked out well. We spaced it out about two feet from the chimney so we'd stay far from the chimney flashing. From the ground, it looks like just another bathroom vent. 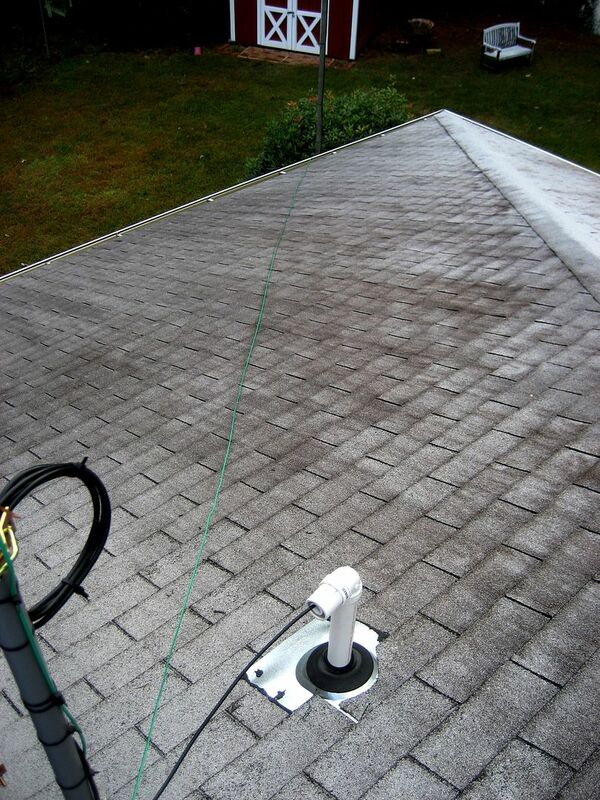 The ground wire (10 gage stranded) is connected to the fiberglass mast (at the roof's edge) and continues down the mast to connect to a grounding rod below. 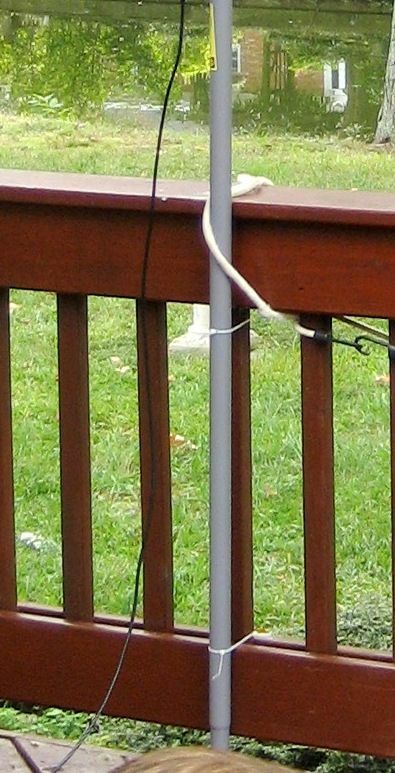 The fiberglass mast supports my Diamond X-200A (dual band) antenna. 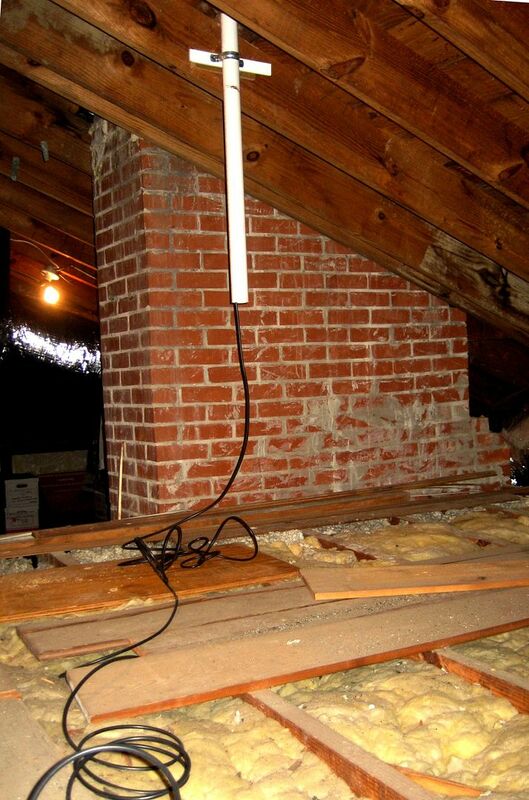 Back in the attic, the PVC pipe provides a nice clean conduit for my RG-8X coax. And here's the other end of that coax, poking out through the brick wall. 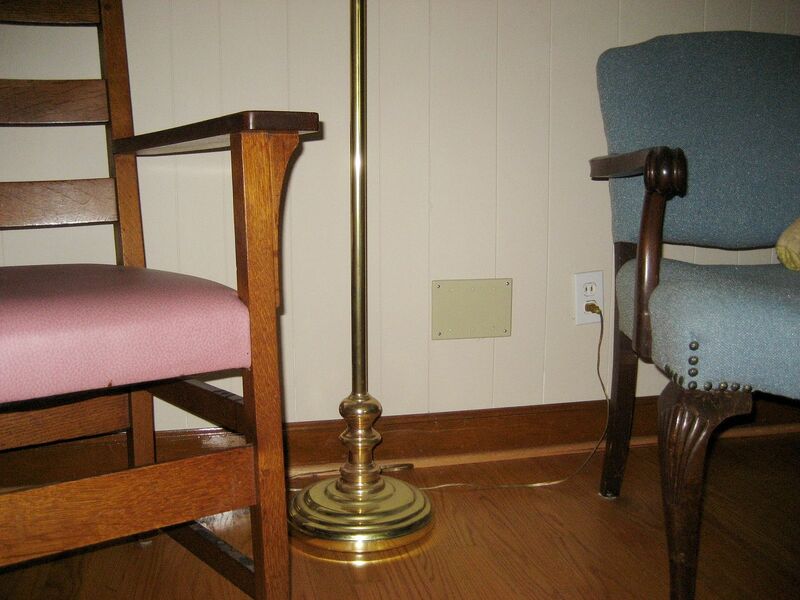 The whole affair (and a lot of wires) are well hidden by this antique oak table. And I bet I'm the only Ham Radio operator in Tidewater with a pink radio room with Hello Kitty decor! 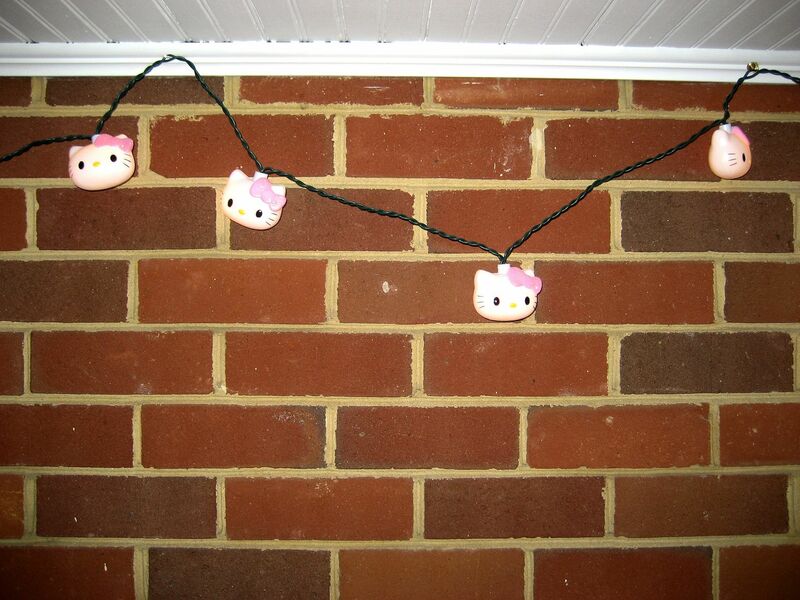 What radio room is complete without Hello Kitty lights? The Comet CHA-250BX is on the left, standing at about 45 feet at the tippy top. From the front of the house, it's really not *that* noticeable. To learn how to identify Sears Homes, click here.